Commonly known as Rambutan it is known botanically as Nephelium lappaceum. The Rambutan is a tropical tree which belongs to the Sapindaceae family and also the fruit of this tree. Although it does not grow very tall, it produces an ample harvest. Rambutan is widely distributed throughout Indonesia, Malaysia and Southeast Asia and is identified in some countries, by different names. 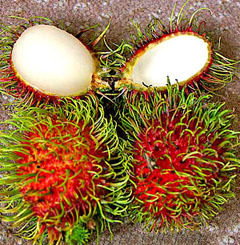 For example, in Nicargua, Costa Rica and Panama, Rambutan is identified as mamon chino while Thailand people call it ngoh. In Malaysia, another type of Rambutan is sold called wild Rambutan. Although the common color of Rambutan is red, the fruit of this particular type is yellowish. The hairy skin of the Rambutan fruit is removed to get to the whitish or pinky edible parts. They typically taste sweet though some are sour as well as sweet. The Rambutan tree grows to about 10 to 20 m in height. Its alternate leaves are 10 to 30 cm in length and pinnate and have three to eleven leaflets, each with an entire margin about 5 to 15 cm in width and 3 to 10 cm in breadth. Petal-less small flowers which are about 2 1/2 to 5 mm in size are disk-shape and they bloom cluster wise. The shape of Rambutan fruit is round or oval and it is about three to six cm by three to four cm in dimension. Rambutan is borne in clusters, and about 10 to 20 Rambutan fruit can be seen. Its leather like skin has pliable thorns. Rambutan fruit is typically red though some are yellow or orange. 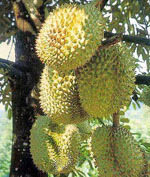 ‘Rambut’ is a Malay word that means ‘hairs’, hence it gets its name because of the thorn like appearance of its fruits. Its brownish seed is about two to three cm in size and is basally scarred. It is soft and crunchy. Although the raw seeds are poisonous, they may be eaten after cooking. 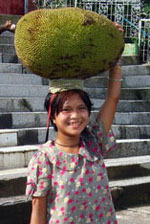 In some countries, the Rambutan tree is very common in gardens. They are also grown in medium sized estates for trading. Although Rambutan are widely seen in Southeast Asian countries, Sri Lanka, Ecuador, India, Indonesia, Malaysia, Philippines, Thailand, the Caribbean, Africa, Cambodia and Central America are also main countries for Rambutan plantations. It is one of the fruits that give out massive harvest in Hawaii as well. Rambutan trees are genetically male or female. Although female Rambutan trees are only with female flowers, the male Rambutan tree has both flowers although female blooms are less. Fragrance of Rambutan flowers entices insects. Mostly, bees can be seen around Rambutan flowers. Many types of butterflies, flies and other types of insects extract a great quantity of honey thus fertilizing them. Since the female flowers lack pollen, they need cross pollinations to be fertilized. Although some cultivars are apomixes, Rambutan mostly depends on insects to be pollinated. From the selected clones, a range of cultivars has been produced up to now. Some of them are highly suitable for harvesting and they are only three to five m in height which makes them easier to be cultivated. Seeds of Rambutan are now available that are developed to bear both the female and male flowers equally well. After removing the fleshy fruit, seeds are thoroughly washed before planting. It will take about nine to 25 days for sprouting. Seedlings give results after five to six years but genetic wise the duration may change. Patch budding is an effective way to propagate Rambutan trees. In this method, one and half month old seedlings are taken and planted in one quart cans with enough manure. Thereafter they are transferred to large containers and this type of trees produces flowers within three years after they are planted out in orchards. Rambutan is a tasty fruit and it is very popular in many countries. Seed oil from the Rambutan is produced and in use to manufacture candles and soap. Although Rambutan trees are cut down rarely, their wood is used in the construction industry. Rambutan fruit is said to heal dysentery and diarrhea effectively. The leaves are also used as cataplasm to cure headaches. 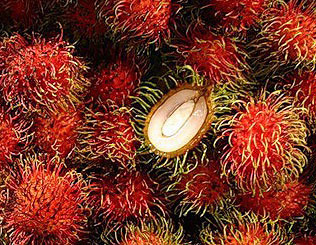 In Malaysia, the skin of the Rambutan fruit is used to prepare native medicines. Further, the roots of Rambutan trees are boiled and used as a medication to cure fever. Rambutan fruit is rich in following components: Fat, Calcium, Iron, Protein, Nitrogen, Ash, Sodium, Zinc, Magnesium, Manganese, Potassium, Phosphorus, pH, Vitamin C, Vitamin A, Thiamin, Riboflavin, Fiber. Eating five fruit in a day can seriously decrease the chance of cancer. Rambutan fruit is also very effective in lowering blood pressure. 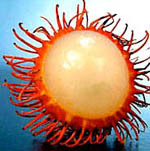 Open Rambutan fruit by removing one part of its skin. Find the seam across the fruit and pull apart the leathery skin. You can also use the knife, but be careful, only cut through the skin. Then you can hold the fruit with your fingers and enjoy the sweet taste. Rambutan fruit cannot be cooked; it can be eaten raw only. I absolutely love rambutan fruit is their anywhere I can purchase it in America? thanks for the information about rambutan fruit.. it was very useful.. I had my third harvest of rambutan from my farm last week and am still waiting for some fruits to ripen. As usual, they were sweet and delicious. This year, however, our rambutan harvest were few. With no distinct dry-wet season arising from changing weather patterns, trees either failed to bear fruit or produced less of it. A fruiting rambutan tree is a sight to behold, especially when ripe. Grafted trees start to bear fruit three years after planting. Palembang Indoneisa is The city Rambutan, you can buy in this city. salam from me friends. Found some rambutans at Meiers in Michigan! 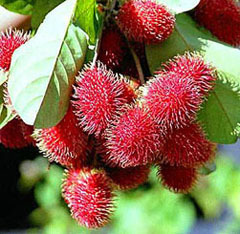 I would like to know if I can grow the rambutan fruit in New York.? Please reply. Thank you. Are seeds edible? I tried to eat the seed too (It resembles almonds) but wondered if they have some side effects? I got the fruit at Safeway.